More than 40 participants have benefited from non-violence training workshop help on the Duport Road Community of Paynesville. The workshop which started on Saturday, February 20-14, 2017 was attended by students, community leaders, motorcyclists and police officers. The Regional Youth Coordinator of Monrovia and Central Region of Camp for Peace Liberia, Mr. Phillip S. Quaqui, said the purpose of the training was to empower young people to deal with violence in their various communities and schools, especially as Liberia prepares for the 2017 presidential elections. Mr. Quaqui urged young Liberians to be very patient in dealing with whatever issues they are faced with, warning that if one becomes impatient, he or she becomes emotional, which likely leads to violence. He said Camp for Peace Liberia is working with other organizations in the country to make the coming elections violence free. As a post-civil conflict country that recently experienced the outbreak of the deadly Ebola virus, Mr. Quaqui expressed the fears that violence was still high in Liberia, with the young generation copying violent style of approach in seeking redress to situations facing them. “And I always tell people, one major cause of young people taking the law into their hands is the issue of fact-finding. Because sometimes we don’t investigate,” he argued. Unfortunately, Quaqui observed that sometimes young people would just be walking in the street, hear noise and subsequently jump into conclusion that the person at the center of the noise was a rogue and must therefore be killed. As a result, he emphasized that violence-related issue was high in Liberia due to how young people react to situations, suggesting that the best option forward was to create an avenue such as training exercise to mold the minds of young Liberians. He said his organization – Camp for Peace Liberia is putting many strategies into place to seek the necessary that will mobilize youth, take them to quiet places to reflect and build their skills, as well as make them to understand a behavior change communication that will enable them differentiate between conflict and confrontation and seek a more peaceful way of solving problem. He said the inclusion of police officers to benefit from the training was vital because, the police are the frontline defenders of violence in any country. He said the police can escalate violence if they are not properly trained with the basic skills to engage the youth during violence. 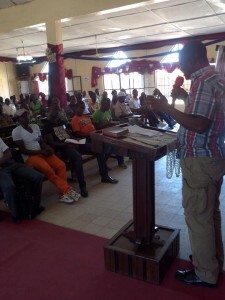 For his part, the Executive Director of CfP Liberia, Mr. B. Abel Lerarwellie called on the youth of Liberia to play meaningful roles so as not to disturb the peace currently enjoyed in Liberia saying saying, that if Liberia was to go back to war, it is the youth that would suffer most since they could not engage in their socio-economic activities”. He therefore urged the youth to go to the various registration centers and register to vote in October 2017. He said our power as youth lies in our vote. “It is better to vote than to fight” Mr. Learwellie concluded.